My name is Andrea Micheli, I am a post-doc researcher in Artificial Intelligence Planning and Temporal Reasoning at the Embedded Systems unit in Fondazione Bruno Kessler. In the past, I worked in the field of Formal Verification, first as a developer of the NuSMV and nuXmv model checkers and later in the development of the KRATOS software model checker. I currently work on temporal planning in presence of temporal uncertainty and continuous resources, and I am one of the leaders of the open-source PySMT project. My primary interests include Artificial Intelligence Planning in Continuous Domains and Temporal Reasoning Under Uncertainty. I focused my research on the study of temporal uncontrollability in planning and I'm currently developing planning systems that take into account these aspects while reasoning. I am also interested in Satisfiablility Modulo Theory especially in Linear and Non-linear Real Arithmetic and Quantified Theories as an enabling technology for my planning research. I am still involved in the development of NuSMV, hence I am interested in Formal Verification in general and Model Checking in particular. My PhD thesis titled "Planning and Scheduling in Temporally Uncertain Domains" has been successfully defended at the University of Trento, Italy on January, 19th 2016. The thesis and the relative additional materials are available from the buttons below. Any form of model-based reasoning is limited by the adherence of the model to the actual reality. In temporal planning applications, complex constraints and synchronizations are required, but often the actual timing of actions is not under direct control of the plan executor. For this reason, planning models must be able to express temporal uncertainty to model this lack of control. In this thesis, we focus on the temporal uncertainty issue in scheduling and in temporal planning. We first analyze the state of the art on the subject presenting a rationalization of existing works. Second we show how Satisfiability Modulo Theory (SMT) solvers can be exploited to quickly solve different kinds of query in the realm of scheduling under uncertainty. Finally, we address the problem of planning in domains featuring real-time constraints and durations where some of the actions have a duration that is not under the control of the planning agent. In several industrial applications of planning, complex temporal metric trajectory constraints are needed to adequately model the problem at hand. For example, in production plants, items must be processed following a "recipe" of steps subject to precise timing constraints. Modeling such domains is very challenging in existing action-based languages due to the lack of sufficiently expressive trajectory constraints. We propose a novel temporal planning formalism allowing quantified temporal constraints over execution timing of action instances. We build on top of instantaneous actions borrowed from classical planning and add expressive temporal constructs. The paper details the semantics of our new formalism and presents a solving technique grounded in classical, heuristic forward search planning. Our experiments prove the proposed framework superior to alternative state-of-the-art planning approaches on industrial benchmarks, and competitive with similar solving methods on well known benchmarks took from the planning competition. To achieve practical execution, planners must produce temporal plans with some degree of run-time adaptability. Such plans can be expressed as Simple Temporal Networks (STN), that constrain the timing of action activations, and implicitly represent the space of choices for the plan executor. A first problem is to verify that all the executor choices allowed by the STN plan will be successful, i.e. the plan is valid. An even more important problem is to assess the effect of discrepancies between the model used for planning and the execution environment. We propose an approach to compute the "robustness envelope" (i.e., alternative action durations or resource consumption rates) of a given STN plan, for which the plan remains valid. Plans can have boolean and numeric variables as well as discrete and continuous change. We leverage Satisfiability Modulo Theories (SMT) to make the approach formal and practical. Planning in real world domains often involves modeling and reasoning about the duration of actions. Temporal planning allows such modeling and reasoning by looking for plans that specify start and end time points for each action. In many practical cases, however, the duration of actions may be uncertain and not under the full control of the executor. For example, a navigation task may take more or less time, depending on external conditions such as terrain or weather. In this paper, we tackle the problem of strong temporal planning with uncontrollable action durations (STPUD). For actions with uncontrollable durations, the planner is only allowed to choose the start of the actions, while the end is chosen, within known bounds, by the environment. A solution plan must be robust with respect to all uncontrollable action durations, and must achieve the goal on all executions, despite the choices of the environment. We propose two complementary techniques. First, we discuss a dedicated planning method, that generalizes the state-space temporal planning framework, leveraging SMT-based techniques for temporal networks under uncertainty. Second, we present a compilation-based method, that reduces any STPUD problem to an ordinary temporal planning problem. Moreover, we investigate a set of sufficient conditions to simplify domains by removing some of the uncontrollability. We implemented both our approaches, and we experimentally evaluated our techniques on a large number of instances. Our results demonstrate the practical applicability of the two techniques, which show complementary behavior. Many Planning and Scheduling systems are designed assuming that the system under control is able to decide the duration of all the activities being executed. However, in many application scenarios this assumption is not acceptable because the actual timing of actions is not under direct control of the plan executor. Hence, new Planning and Scheduling techniques are needed to deal with this temporal uncertainty explicitly. In this paper, we summarize and systematize a series of works in which we addressed this uncertainty problem in the realm of temporal network scheduling. We show how Satisfiability Modulo Theory (SMT) solvers can be exploited to quickly solve different kinds of query in this setting. In particular, we focus on the framework of Disjunctive Temporal Networks with Uncertainty and address the three degrees of controllability for the fully-disjunctive class of problems, solving several open problems in the literature and experimentally showing the performance of the developed techniques. Finally, we outline and discuss several foreseeable directions of research in this field. Temporal planning is an active research area of Artificial Intelligence because of its many applications ranging from robotics to logistics and beyond. Traditionally, authors focused on the automatic synthesis of plans given a formal representation of the domain and of the problem. However, the effectiveness of such techniques is limited by the complexity of the modeling phase: it is hard to produce a correct model for the planning problem at hand. In this paper, we present a technique to simplify the creation of correct models by leveraging formal-verification tools for automatic validation. We start by using the ANML language, a very expressive language for temporal planning problems that has been recently presented. We chose ANML because of its usability and readability. Then, we present a sound-and-complete, formal encoding of the language into Linear Temporal Logic over predicates with infinite-state variables. Thanks to this reduction, we enable the formal verification of several relevant properties over the planning problem, providing useful feedback to the modeler. Temporal networks are data structures for representing and reasoning about temporal constraints on activities. Many kinds of temporal networks have been defined in the literature, differing in their expressiveness. The simplest kinds of networks have polynomial algorithms for determining their temporal consistency or different levels of controllability, but corresponding algorithms for more expressive networks (e.g., those that include observation nodes or disjunctive constraints) have so far been unavailable. This paper introduces a new approach to determine the dynamic controllability of a very expressive class of temporal networks that accommodates observation nodes and disjunctive constraints. The approach is based on encoding the dynamic controllability problem into a reachability game for Timed Game Automata (TGAs). This is the first sound and complete approach for determining the dynamic controllability of such networks. The encoding also highlights the theoretical relationships between various kinds of temporal networks and TGAs. The new algorithms have immediate applications in the design and analysis of workflow models being developed to automate business processes, including workflows in the health-care domain. The Temporal Network with Uncertainty (TNU) modeling framework is used to represent temporal knowledge in presence of qualitative temporal uncertainty. Dynamic Controllability (DC) is the problem of deciding the existence of a strategy for scheduling the controllable time points of the network observing past happenings only. In this paper, we address the DC problem for a very general class of TNU, namely Disjunctive Temporal Network with Uncertainty. We make the following contributions. First, we define strategies in the form of an executable language; second, we propose the first decision procedure to check whether a given strategy is a solution for the DC problem; third we present an efficient algorithm for strategy synthesis based on techniques derived from Timed Games and Satisfiability Modulo Theory. The experimental evaluation shows that the approach is superior to the state-of-the-art. Satisfiability Modulo Theory is increasingly being used as workhorse in multiple and disparate domains. Several efficient solvers exist and cross-compatibility is provided by a wide adoption of the SMT-Lib interface. Nevertheless, there are still some obstacles that slow down the development of algorithms based on the SMT technology. First, there is no common programmatic API among different solvers: a user needs to commit to a specific solver API early in the development, or implement a text-based interaction via the SMT-Lib interface, thus losing the ability of exploiting features provided by solvers that are not part of the SMT-Lib. Second, there is no high-level SMT API for fast prototyping: a user often needs to re-implement common routines such as substitution and type-checking. In this paper, we introduce pySMT, an open-source python library that provides a solver agnostic interface to define, manipulate and solve SMT formulae. pySMT leverages the native APIs of solvers (if available) or their SMT-LIB interface. The library allows the seamless combination of different solvers and fast prototyping of complex SMT-based algorithms. Real world temporal planning often involves dealing with uncertainty about the duration of actions. In this paper, we describe a sound-and-complete compilation technique for strong planning that reduces any planning instance with uncertainty in the duration of actions to a plain temporal planning problem without uncertainty. We evaluate our technique by comparing it with a recently-presented technique for PDDL domains with temporal uncertainty. The experimental results demonstrate the practical applicability of our approach and show a complementary behavior with respect to the previous techniques. We also demonstrate the high expressiveness of the translation by applying it to a significant fragment of the ANML language. This paper describes the XSAP safety analysis platform. XSAP provides several model-based safety analysis features for finite- and infinite-state synchronous transition systems. In particular, it supports library-based definition of fault modes, an automatic model extension facility, generation of safety analysis artifacts such as Dynamic Fault Trees (DFTs) and Failure Mode and Effects Analysis (FMEA) tables. Moreover, it supports probabilistic evaluation of Fault Trees, failure propagation analysis using Timed Failure Propagation Graphs (TFPGs), and Common Cause Analysis (CCA). XSAP has been used in several industrial projects as verification back-end, and is currently being evaluated in a joint R&D Project involving FBK and The Boeing Company. The framework of temporal problems with uncertainty (TPU) is useful to express temporal constraints over a set of activities subject to uncertain (and uncontrollable) duration. In this work, we focus on the most general class of TPU, namely disjunctive TPU (DTPU), and consider the case of weak controllability, that allows one to model problems arising in practical scenarios (e.g. on-line scheduling). We first tackle the decision problem, i.e. whether there exists a schedule of the activities that, depending on the uncertainty, satisfies all the constraints. We propose a logical approach, based on the reduction to a problem of Satisfiability Modulo Theories (SMT), in the theory of Linear Real Arithmetic with Quantifiers. This results in the first implemented solver for weak controllability of DTPUs. Then, we tackle the problem of synthesizing control strategies for scheduling the activities. We focus on strategies that are amenable for efficient execution. We prove that linear strategies are not always sufficient, even in the sub-case of simple TPU (STPU), while piecewise-linear strategies, that are multiple conditionally-applied linear strategies, are always sufficient. We present several algorithms for the synthesis of linear and piecewise-linear strategies, in case of STPU and of DTPU. All the algorithms are implemented on top of SMT solvers. We provide experimental evidence of the scalability of the proposed techniques, with dramatic speed-ups in strategy execution compared to on-line reasoning. Timed Failure Propagation Graphs (TFPGs) are a formalism used in industry to describe failure propagation in a dynamic partially observable system. TFPGs are commonly used to perform model-based diagnosis. As in any model-based diagnosis approach, however, the quality of the diagnosis strongly depends on the quality of the model. Approaches to certify the quality of the TFPG are limited and mainly rely on testing. In this work we address this problem by leveraging efficient Satisfiability Modulo Theories (SMT) engines to perform exhaustive reasoning on TFPGs. We apply model-checking techniques to certify that a given TFPG satisfies (or not) a property of interest. Moreover, we discuss the problem of refinement and diagnosability testing and empirically show that our technique can be used to efficiently solve them. In many practical domains, planning systems are required to reason about durative actions. A common assumption in the literature is that the executor is allowed to decide the duration of each action. However, this assumption may be too restrictive for applications. In this paper, we tackle the problem of temporal planning with uncontrollable action durations. We show how to generate robust plans, that guarantee goal achievement despite the uncontrollability of the actual duration of the actions. We extend the state-space temporal planning framework, integrating recent techniques for solving temporal problems under uncertainty. We discuss different ways of lifting the total order plans generated by the heuristic search to partial order plans, showing (in)completeness results for each of them. We implemented our approach on top of COLIN, a state-of-the-art planner. An experimental evaluation over several benchmark problems shows the practical feasibility of the proposed approach. Temporal Problems (TPs) represent constraints over the timing of activities, as arising in many applications such as scheduling and temporal planning. A TP with uncertainty (TPU) is characterized by activities with uncontrollable duration. Different classes of TPU are possible, depending on the Boolean structure of the constraints: we have simple (STPU), constraint satisfaction (TCSPU), and disjunctive (DTPU) temporal problems with uncertainty. In this paper we tackle the problem of strong controllability, i.e. finding an assignment to all the controllable time points, such that the constraints are fulfilled under any possible assignment of uncontrollable time points. Our approach casts the problem in the framework of Satisfiability Modulo Theory (SMT), where the uncertainty of durations can be modeled by means of universal quantifiers. The use of quantifier elimination techniques leads to quantifier-free encodings, which are in turn solved with efficient SMT solvers. We obtain the first practical and comprehensive solution for strong controllability. We provide a family of efficient encodings, that are able to exploit the specific structure of the problem. The approach has been implemented, and experimentally evaluated over a large set of benchmarks. The results clearly demonstrate that the proposed approach is feasible, and outperforms the best state-of-the-art competitors, when available. This paper describes the nuXmv symbolic model checker for finite- and infinite-state synchronous transition systems. nuXmv is the evolution of the NuSMV open source model checker. It builds on and extends NuSMV along two main directions. For finite-state systems it complements the basic verification techniques of NuSMV with state-of-the-art verification algorithms. For infinite-state systems, it extends the NuSMV language with new data types, namely Integers and Reals, and it provides advanced SMT-based model checking techniques. Besides extended functionalities, nuXmv has been optimized in terms of performance to be competitive with the state of the art. nuXmv has been used in several industrial projects as verification back-end, and it is the basis for several extensions to cope with requirements analysis, contract based design, model checking of hybrid systems, safety assessment, and software model checking. Temporal networks are data structures for representing and reasoning about temporal constraints on activities. Many kinds of temporal networks have been defined in the literature, differing in their expressiveness. The simplest kinds of networks have polynomial algorithms for determining their consistency or controllability, but corresponding algorithms for more expressive networks (e.g., those that include observation nodes or disjunctive constraints) have so far been unavailable. However, recent work has introduced a new approach to such algorithms based on translating temporal networks into Timed Game Automata (TGAs) and then using off-the-shelf software to synthesize execution strategies - or determine that none exist. So far, that approach has only been used on Simple Temporal Networks with Uncertainty, for which polynomial algorithms already exist. This paper extends the temporal-network-to-TGA approach to accommodate observation nodes and disjunctive constraints. Insodoing the paper presents, for the first time, sound and complete algorithms for checking the dynamic controllability of these more expressive networks. The translations also highlight the theoretical relationships between various kinds of temporal networks and the TGA model. The new algorithms have immediate applications in the workflow models being developed to automate business processes, including in the health-care domain. 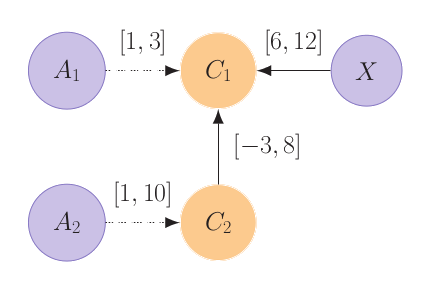 A Simple Temporal Network with Uncertainty (STNU) is a structure for representing and reasoning about temporal constraints in domains where some temporal durations are not controlled by the executor. The most important property of an STNU is whether it is dynamically controllable (DC); that is, whether there exists a strategy for executing the controllable time-points that guarantees that all constraints will be satisfied no matter how the uncontrollable durations turn out. This paper provides a novel mapping from STNUs to Timed Game Automata (TGAs) that: (1) explicates the deep theoretical relationships between STNUs and TGAs; and (2) enables the memoryless strategies generated from the TGA to be transformed into equivalent STNU execution strategies that reduce the real-time computational burden for the executor. The paper formally proves that the STNU-to-TGA encoding properly captures the execution semantics of STNUs. Timelines are a formalism to model planning domains where the temporal aspects are predominant, and have been used in many real-world applications. Despite their practical success, a major limitation is the inability to model temporal uncertainty, i.e. the fact that the plan executor cannot decide the actual duration of some activities. In this paper we make two key contributions. First, we propose a comprehensive, semantically well founded framework that (conservatively) extends with temporal uncertainty the state of the art timeline approach. Second, we focus on the problem of producing time-triggered plans that are robust with respect to temporal uncertainty, under a bounded horizon. In this setting, we present the first complete algorithm, and we show how it can be made practical by leveraging the power of Satisfiability Modulo Theories. Many applications, such as scheduling and temporal planning, require the solution of Temporal Problems (TP's) representing constraints over the timing of activities. A TP with uncertainty (TPU) is characterized by activities with uncontrollable duration. Depending on the Boolean structure of the constraints, we have simple (STPU), constraint satisfaction (TCSPU), and disjunctive (DTPU) temporal problems with uncertainty. In this work we tackle the problem of strong controllability, i.e. finding an assignment to all the controllable time points, such that the constraints are fulfilled under any possible assignment of uncontrollable time points. We work in the framework of Satisfiability Modulo Theory (SMT), where uncertainty is expressed by means of universal quantifiers. We obtain the first comprehensive solution to strong controllability: the use of quantifier elimination techniques leads to quantifier-free encodings, which are in turn solved with efficient SMT solvers. We provide a detailed experimental evaluation of our approach over a large set of benchmarks. The results clearly demonstrate that the proposed approach is feasibile, and outperforms the best state-of-the-art competitors, when available. Temporal Problems with Uncertainty are a well established formalism to model time constraints of a system interacting with an uncertain environment. Several works have addressed the definition and the solving of Controllability problems, and three degrees of controllability have been proposed: Weak, Strong, and Dynamic. In this work we focus on Weak Controllability: we address both the decision and the strategy extraction problems. Extracting a strategy means finding a function from assignments to uncontrollable time points to assignments to controllable time points that fulfills all the temporal constraints. We address the two problems in the Satisfiability Modulo Theory framework. We provide a clean and complete formalization of the problems, and we propose novel techniques to extract strategies. We also provide experimental evidence of the scalability and efficiency of the proposed techniques. The growing popularity of SystemC has attracted research aimed at the formal verification of SystemC designs. In this paper we present KRATOS, a software model checker for SystemC. KRATOS verifies safety properties, in the form of program assertions, by allowing users to explore two directions in the verification. First, by relying on the translation from SystemC designs to sequential C programs, KRATOS is capable of model checking the resulting C programs using the symbolic lazy predicate abstraction technique. Second, KRATOS implements a novel algorithm, called ESST, that combines Explicit state techniques to deal with the SystemC Scheduler, with Symbolic techniques to deal with the Threads. KRATOS is built on top of NuSMV and MathSAT, and uses state-ofthe-art SMT-based techniques for program abstractions and refinements. Requirement engineering is one of the most important phases in the development process of software and systems. In safety-critical applications, it is important to support the validation of the requirements with formal techniques to identify and remove flaws. However, requirements are often written in textual documents and their formalization and validation is not trivial for non-experts in formal methods. The goal of the OthelloPlay tool is to support formalization of textual requirements and to simplify the use of formal techniques for requirements validation. The tool combines a formal verification engine and the Microsoft Word editor in a single and consistent environment. A fundamental key in our design approach is a plug-in-based architecture, which uses the Python language in conjunction with a Microsoft Word Add-In. The user can jump between textual requirements in the Microsoft Word editor and the corresponding formal requirements model. SystemC is becoming a de-facto standard for the development of embedded systems. Verification of SystemC designs is critical since it can prevent error propagation down to the hardware. SystemC allows for very efficient simulations before synthesizing the RTL description, but formal verification is still at a preliminary stage. Recent works translate SystemC into the input language of finite-state model checkers, but they abstract away relevant semantic aspects, and show limited scalability. In this paper, we approach formal verification of SystemC by reduction to software model checking. We explore two directions. First, we rely on a translation from SystemC to a sequential C program, that contains both the mapping of the SystemC threads in form of C functions, and the coding of relevant semantic aspects (e.g. of the SystemC kernel). In terms of verification, this enables the “off-the-shelf” use of model checking techniques for sequential software, such as lazy abstraction. Second, we propose an approach that exploits the intrinsic structure of SystemC. In particular, each SystemC thread is translated into a separate sequential program and explored with lazy abstraction, while the overall verification is orchestrated by the direct execution of the SystemC scheduler. The technique can be seen as generalizing lazy abstraction to the case of multi-threaded software with exclusive threads and cooperative scheduling. The above approaches have been implemented in a new software model checker. An experimental evaluation carried out on several case studies taken from the SystemC distribution and from the literature demonstrate the potential of the approach. We present the EuRailCheck tool, which supports the formalization and the validation of requirements, based on the use of formal methods. The tool allows the user to analyze the requirements in natural language and to categorize and structure them. It allows to formalize the requirements into a subset of UML enriched with static and temporal constraints for which we defined a formal semantics. Finally, the tool allows to apply model checking techniques specialized for the validation of formal requirements. The tool has been developed and validated within a project funded by the European Railway Agency for the validation of the European Train Control System specification. By now, the tool has been successfully used by about thirty railway experts of different companies. I served as teaching assistant for the Functional and Logic Programming Languages course at the Free University of Bolzano during the academic year 2010/2011.